Say what you will about Sci-Fi’s favorite punching bag and his recent lament that the election of the God Emperor to the Cherry Blossom Throne has left him incapable of stringing enough words together in any given day to honor his contract, at least the man admits to his own failings. And I know exactly how he feels – just on the other side of the equation. Whatever (heh) his goal, I’m here to tell you it has been a source of inspiration for this deplorable writer. The constant string of successful ventures and growing army of content producers on the side of truth, justice, and the American way provides real sustenance and inspiration to those of us who enjoy laboring in the trenches. Watching guys like Jon del Arroz and Brian Niemeier and Nick Cole and so many others hit great selling home run after home run serves as a constant reminder that a vastly underserved market exists and that the self-proclaimed arbiters of quality and decency are paper tigers. Far from being tired of all of the winning, I’m energized by it. In the last week I’ve spun more than 15,000 words of dimension hopping fun. I’m on pace to publish more than 250,000 words this years – far short of even Pulp Speed One, but for a family man regularly working 60+ hours a week at his day job, that’s an incredible pace. 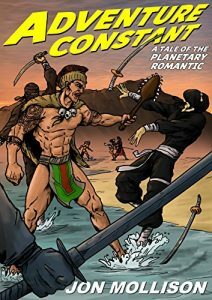 My next book, a sequel to the highly praised Adventure Constant, presents a grim world where heroism and virtue punished by the very laws of the universe, and the natural result of that is a world where the antifa types have the run of the place. The hero of the piece, Jack Dashing, might not be enough to save the world from the petty opportunists, but he finds a way to make the strange new world a better place. He finds a way to push the prevailing culture a little more towards one of honor and dignity. Back the Alt*Hero comic book line by Castalia House. Even a couple of bucks adds numbers to the “Backers” count and strengthens the argument that an audience for such works exists. Subscribe to YouTube cultural critics such as Diversity and Comics, Capn Cummings, and Nerkish. You don’t have to watch every video. Just lending your name helps demonstrate the something rotten in the Kingdom of Marvel. Reject the big boys in the tabletop RPG industry and support independent designers like Autarch of Adventurer Conqueror King fame. Impervious to rot that pervades the larger corporate designers, their works have all the quality of his larger competitors and twice the energy. Back the small press short fiction market. Cirsova, Storyhack, and Tales from the Magician’s Skull all offer the same excitement and adventure as the staid old relics of a by gone era, without the downside of sending your money to people who hate you. Stop watching the NFL. Scale back your movie-going. Cancel Netflix*. You don’t have to quit cold turkey. You can’t kill that giant, but you can make it bleed. Just think hard about every dollar you send to the people who supported Harvey Weinstein. If everyone cut their spending on Hollywood by half, it would crash within six months. And you don’t have to do it all right this instant. I can’t cancel Netflix until after Stranger Things is binge-consumed by my family. I fully admit that I would face a full scale revolt on the home front if the family misses out on that one. I’m not backing the Magician’s Skull KickStarter because KickStarter hates my political allies, but I’ll be there when it is released. Knowing how to pick battles you can win is a big part of the culture war, too! Just shift your mindset. Change your focus. Support your friends and turn your back on your enemies. Just as with adopting a more healthy lifestyle, small changes made over time can add up to a huge difference.